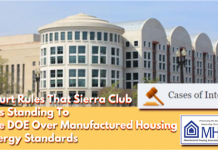 Washington, D.C., December 3, 2018 – The Manufactured Housing Association for Regulatory Reform (MHARR) reports that according to official statistics compiled on behalf of the U.S. Department of Housing and Urban Development (HUD), HUD Code manufactured home production declined slightly, once again, in October 2018. Just-released statistics indicate that HUD Code manufacturers produced 8,588 homes in October 2018, a slight .5% decline from the 8,636 new HUD Code homes produced during October 2017. This being the second month in a row with a slight year-over-year production decline, MHARR will carefully monitor – and begin analyzing these numbers — going forward. On a cumulative basis, industry production for 2018 now totals 82,795 homes, a 7.4% increase over the 77,055 HUD Code homes produced over the same period in 2017. The latest information for October 2018, does not result in any changes to the cumulative top-ten list.